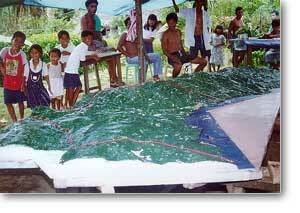 1:5,000-scale model of Barangay Bolos Point, Gattaran, Cagayan Province, of Region II in Northern Luzon Philippines. 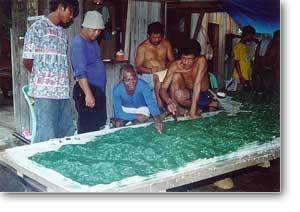 The model (Yr 2001) covers an area of 25,000 ha and includes a Community-based Forest Management (CBFM) area. Note: The barangay has an estimated area of about twenty-five thousand hectares, almost all of it covered with an intact dipterocarp forest. About half of this area is granted under a community-based forest management agreement (CBFMA) to the Bolos Point Multi-Purpose Cooperative, Inc. (BPMPCI), an organization based in the barangay proper with a member population of some one hundred seventy migrant families and about thirty families belonging to the Aggay tribe. The Cagayan Valley Partners in People Development (CAVAPPED), an NGO based in Tuguegarao City assists the CBO in managing their resources. The activity has been carried out to assist CAVAPPED and its clientele community to develop an effective and convenient tool for resource protection and management. Considering the rich forest resources of this isolated area outside pressure is likely to increase with improved transport facilities. The construction of the 3-D model has aimed at facilitating the visualization of the extent and distribution of resources to enhance the capacity of the community in managing and protecting their resources in a sound manner. The 3-D model also attracts wider participation from the community since even children and ordinary folks can easily grasp the information presented, unlike from that of an ordinary map. Model produced by Cagayan Valley Partners in People Development (CAVAPPED) with technical assistance provided by PAFID and financial support by the Foundation For Philippine Environment.